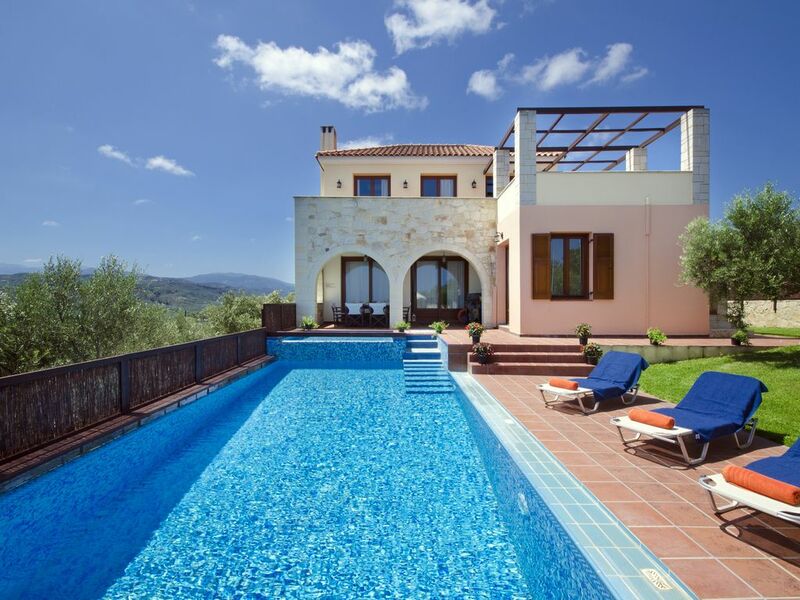 Villa Katerina:An Ideally located Villa with Heated pool,to explore West Crete!! Luxuriously appointed Villa Katerina is set in a quiet location in W. Crete, surrounded by stunning views of The White Mountains and sea. Villa Katerina is provided with the special sign of the Greek Tourist Organization (EOT-1042K122K015040000) which secures the quality level of all services, terms and conditions our guests have the privilege to enjoy during their stay. Laze around your own beautiful private & secluded heated Pool, listening to bird-song and enjoying the scent of fragrant flowers. Overlooking your own private Pool, and the sea, one of the bedrooms is on the ground floor and has a double bed and en-suite shower room with Jacuzzi bath. The other two bedrooms are on the first floor. One of them has a double bed and en-suite bathroom with Hydro Massage Shower. The other one has a king size double bed and an en-suite bathroom with Hydro Massage Shower. From both upstairs bedrooms you step out onto a large veranda which overlooks the olive groves, the White Mountains and the sea. On the ground floor there is an open plan living/dining room with a large couch for 6 persons, an easy chair and a big Lcd TV . DVD and CD played are also provided. There is also a fully equipped kitchen with oven, fridge-freezer, dishwasher, microwave, washing machine and all the necessary requirements for cooking a meal of your taste. The interior of the Villa is air-conditioned for comfort on hot summer days. For any chill days possibly early and late season, there is heating throughout the entire Villa plus a cosy fireplace in the living room. Outside the Villa in a designated place you can find plenty of wood. Enjoy the pleasures of the local tavernas, or eat by your Pool on long, warm balmy evenings. Whether you are looking for a totally relaxing, or a more adventurous holiday, you will find that Villa Katerina is the perfect base. We brought even closer the nature to you and your table with more fruits and vegetables from our garden and fresh eggs from a new small hennery a few meters away from the Villa.. You can collect vegetables and eggs by yourself!!! Welcome pack: A welcome pack will await you in the Villa, consisting of traditional fresh organic products. A bottle of olive oil, raki, and local wine from Yianni, Katerina's husband's, own farm. For you to enjoy leisurely breakfasts on your terrace overlooking the Pool, there is a breakfast pack consisting of bread, natural juices, eggs, bacon, honey and butter,upon your arrival. Ask me for extra eggs,oil,raki and honey during your stay!! Bath & Pool towels,shampoo,shower gel,conditioner and hairdryer, are provided. The Villa is cleaned twice a week which includes linen and towel (bath and pool) change. Special Discounts : Big Discounts are provided for bookings of 3 weeks or more and for bookings of two persons !!! There is a Children's Pool adjacent to main Pool. We can also offer you several sevrices: I could arrange for you boat trips, samaria gorge transfers, massage, sailing, cooking services, etc.. The villa is a perfect home away from home -stocked with everything you could need. Plus a gorgeous, twinkling pool, views of the mountains and the sea... Spilia village is great, very relaxed, friendly people especially in the tavernas. Manolis is a great host, kind, thoughtful, welcoming with weather- and family- relevant ideas about where to go and what to do. and knows about amazing pastry... we would happily return! We passed 3 weeks during November in Villa Katerina. We decided to travel to Crete during this period because we could go any other period. We knew that maybe we would have a bad weather but we risked it! !And we didn't regret it! !We finally chose a lovely place with a heated pool, in case of cold days. There were a lot of options, so we based on the reviews this Villa had. And after these 3 weeks we can understand the reasons of making people write such a grate comments. Manolis is a grate host and an intelligent man. He made us feel like our home., we enjoyed so much the time we passed together. In most of the reviews other visitors highlighted the welcome pack Manolis offers. Now i can understand....There are so many things he offers, and so good quality. The olive oil, the cheese the honey and of course the eggs, were so tasty! The pool was amazing, the water temperature was perfect, by using the heated pump, and we spent a lot of days relaxing in the pool area , watching the grate view of the sea and the white mountains! The villa inside have everything you need. 3 bathrooms and 3 bedrooms. 2 ofd the beds are so big! !There are 2 different places you can relax. Near the pool or upstairs on the veranda! !Photos which are uploaded in the site are nice, but it cannot represent the energy and the beauty this Villa and the owner provide. Manolis was immediately available in person or by text to answer any questions and provide help in planning trips and reserving restaurants for us. His recommendations were brilliant, most of the tips was hidden and we would not find it without his help. Manolis thank you so much! We will come again next year for sure. Very comfortable clean and convenient villa, and we could not have asked for a better host. Manolis ensured that there were plenty of local hints and tips which really helped us make the most of our weeks stay. He also provided the best welcome pack that we've ever had. We really enjoyed tasting the local produce and that included sampling his grandmother's cooking. The villa was ideally situated within easy walking distance of two local taverns and easy access to the main road to get to both Chania and the beaches of Western Crete. It was in a peaceful location with good views of both the mountains and the coast. When we booked Villa Katerina,over six months ago based on the reviews and photos we had high, high expectations.....and they were exceeded! It is even MORE beautiful than the pictures, Manolis is even MORE amazing as host than the reviews describe and our stay overall was even better than I could have hoped. We were so glad we chose to stay in Spilia, a quiet, charming village in the best location for exploring the beaches and the city of Chania and relaxing. The house is of course spotless, the beds are huge and the WiFi fast.The welcome pack Manolis provided to us was a big surprise for. We had read for this in the reviews but we could not imagine all these things he offered to us. During our staying he gave us more eggs more olive oil,more honey and more wine!! !We loved very product he gave us.Every time we met him he asked us if we need anything he made us feel like home (even better). Manolis tips is another thing have to mention...Just follow it...He gave us 6 pages of things we can do ...We tried most of them. There are some secrets i won;t mention it....The beaches of Balos , Falasarna and Elafonisi are easily reached, the beautiful city of Chania also. We spent a lot of time in the villa, just relaxing and the village of Spilia. There are 2 taverns there with grate traditional food some meters away from the Villa.In less than 1 km there is also a church in a cave where you can have a pick nick.Kolimvari (5 minutes drive) has also grate food (specially seafood). There are so many things i could mention....Every time we did something, we checked it in from Manolis list. There are so many things we didn;t do...So..We will come back next summer. Thank you Manolis for evrything you did for us! Thank you so much Bernd, Helga and family for your comments. You were the first family all these years, you wrote a review before your departure by my laptop.It means a lot for me and it makes me feel that i did something for you to improve your staying. Looking forward to meeting you again!! We had a grate time in this Villa. Manolis the owner offered us a huge welcome pack, which included olive oil, honey, Cretan cheese, bacon, bread and many fruits, The Villa has everything you need if you want to cook, but if you want you can also go to a very nice traditional tavern a few steps away. Manos also gave us grate tips, so we tied to visit all these places. Most of them were not so touristic, like Deliana, Afrata, Palaiochora, Sfinari,etc. We also arranged us a grate trip to Samaria gorge, which we enjoyed a lot. He has a grate sense of humor and from the first moment we arrived to the Villa we felt like being home. We definitely recommend this Villa for holidays, we have already booked the Villa for our next year vacations. What an amazing place to stay. There are so many things to say, I think it is best to break everything into groups. Location: Spilia is a quiet, quaint town located just 2 miles from the sea. As you can see from the pictures, the views from the villa are absolutely beautiful. There were only a few restaurants in the small town, but they have very good food and the friendly staff treat you as family from the second you arrive. The Tavern Platanias is a short walk away with great lunch and dinner, while the elegant "Spilia Village" hotel just past that offers an amazing breakfast buffet with a charming atmosphere. Another new tavern is situated in the square of the village and it is also a very good choice. Spilia is centrally located in the western region of Crete with a variety of things to do within an hour drive. The coastal town of Kolymvari is just 2 miles away with great touristy trinket shopping and amazing seafood. There are a number of beaches including Elafonissi, Falasarna, and of course the famous Balos. There are caves with shrines, churches, and scenic views within walking distance. Ask Manolis about the local cooking classes, you visit a farm to pick fresh vegetables and herbs and experience Cretan hospitality and culture first hand. Samaria Gorge is a full day hike relatively nearby and Lake Agia offers a serene place to have coffee/lunch. Platanius is a 17-20 Euros taxi ride away if you want to drink with the locals/other tourists (Club Mylos doesn't start getting packed until 4am). Chania is only 20-25 minutes away and is the second largest city on Crete with its own large number of activities nearby (we recommend "secret beach" called Seitan Limania to locals). We were here for a week and packed 2-3 things to do every day and still missed out on a big number of things. Villa: The pictures barely do it justice. It was clean, fully stocked with towels, dishes, cookware and all other essentials. Manolis also stocked Greek coffee, local cask red wine, white wine, local liquor (Raki), bread,butter, local honey, eggs from his chickens, bacon and fruits. It receives plenty of wind and cooler temperatures due to the elevation. AC in each room. Maid service every few days. Host: Manolis is an amazing host, he sat down with us when we arrived and recommended a number of activities and answered any questions we had. He was accessible throughout our stay via what;s up. He brought homemade food and was always welcoming and helpful. Spila is located on the edge of the plain of Chania 2 km from Kolymvari, 22km from Chania city-centre and 35 km from the airport of Chania. The village is near the junction with the national road which allows access to Chania in less than 25 minutes and makes easy the access to the most famous places in West Crete. The village Spilia (cave in Greek) is named after the Cave of Ai-Yiannis Erimitis which is located in the west part of the village on a hill, on an impressive site of great historical importance with exceptional view. Near the entrance of the Cave of St. John the Hermit there is an underground water collector, while the sides of the arcade are decorated with stalagmites and stalactites. The Cave of St John the Hermit exudes a religious character, as it is adorned with icons and ecclesiastical objects that hang on its walls. Dominating the village is the Church of Panayia Myrtidiotissa whilst, a short distance away from the Villa (100m away) is situated a very pleasant and locally taverna offering traditional food. The tavern is under a dense vegetation of extremely high Plane Trees, that are centuries old. Close by, there are 1 small mini-market and 1 bigger one,where you will find provisions; fresh bread, fruit and vegetables and indispensable articles. In the village there are many pleasant tavernas, restaurants and kafenios, a post office, a medical center, a supermarket and bank / ATM’s. Spilia village is ideally located for you to visit the most important coasts of Crete, the well-known Falassarna with the immense sandy beach, the ancient town and the enchanting lagoon of Elafonisi, attractions awarded by international organizations for their clearness and the multi coloured sand formations. In the wider area is set the beautiful lagoon of Balos at Gramvousa, where you can enjoy all the tints of blue and green. West Crete has much to offer, sightseeing, archaeological sites, the lovely beaches of Falassarna, Elafonissi and Balos which are all within easy driving distance from the Villa. The famous Samaria Gorge, and many other wonderful Gorges (famous and not famous) & walks in the countryside are another option. Go and visit the maybe the oldest olive tree in the world at Vouves.It still produces olive oil today! !You only need 10 minutes drive. Crete as it may sound absurd is an ideal destination for those who want to ski at Cretan mountains. With many options , alternative routes - crossings and in combination with the quality of life would not be an exaggeration to say that the island of Crete is a paradise for those who want something different deep in the heart of winter. ABOVE RATES INCLUDE: • Our rates are quoted in Euros including municipal TAX and VAT • We offer to our guests unique prices for car hiring !!! • Traditional welcome package • Cleaning Maid twice per week • Secutiry Alarm System • Pool cleaning • Garden trim and care • Wireless high-speed broadhand intenet • Big Discounts & a Free Car Group A for 3 or more weeks bookings! Cars are collectable from both Heraklion and Chania airports Upgrades are available at extra cost.